Now, 30+ years after his extraordinary emergence into the music business, Cross continues his recording and performing career with a new album, Take Me As I Am, that evokes the artistry of such great singer-songwriters as Joni Mitchell and Randy Newman while addressing contemporary concerns head-on – a combination which is sure to please his loyal fan base. 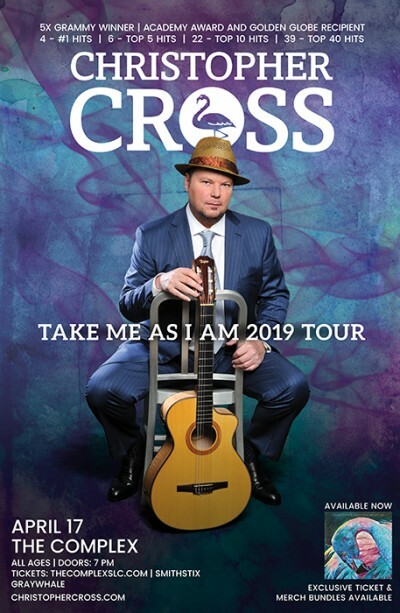 "Take Me As I Am" is a unique offering from Christopher Cross, a hybrid of sorts – the songs are instrumentals with choruses to create the lyrical landscape. This is not quite a “guitar” album, but it leaves the listener with no question about his expertise on the subject. Two very special songs are “Roberta," dedicated to Christopher’s mentor, Joni Mitchell, and “Truth” with a lyric by Rob Meurer, one of the last songs Rob wrote before his tragic passing. This song is sung as a duet with Gigi Worth, a name that will be familiar to Christopher’s fans. Gigi and Rob were also very close, which makes her performance on this track all the more meaningful. The album closes with a song in memory of Rob called "Alvah," (Rob’s middle name), which features beautiful string arrangements by Chris Walden.